Better to get the septic tanks into place first. The small block of land made things cramped, the digging jobs along the back fence had to be done first. As soon as the two ceremonial piers had been poured with concrete, I had the holes dug for the septic tanks. 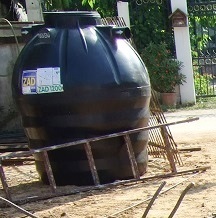 The plastic tank was filled with water so it would not float if it happened to rain. Early into the job I realized that a throne type toilet was needed before the bathrooms was ready. An old toilet bowl from the previous dwelling was temporarily connected as soon as the septic tank was in place. With a privacy screen this was suitable for me until the first bathroom was usable. When the excavator was digging the holes for the septic he also dug four more of the holes for the footings. 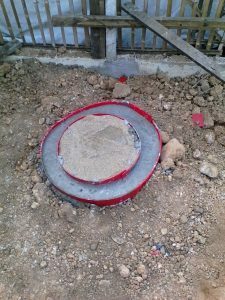 In Chiang Mai the septic tanks system is usually one big plastic drum and 2 round concrete wells, the wells are about 2 meters deep and 90 centimeters in diameter. One concrete well for septic and the other for shower and kitchen etc. 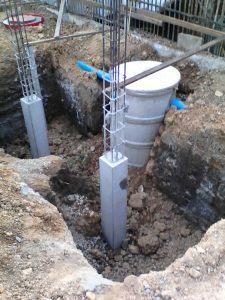 On other house buildings sites I have seen 2 plastic tanks and three concrete wells. The plastic tank has a provision for a breather. With each tank a bag of ‘starter’ chemicals is usually supplied, also, 2 flexible 100 millimeter diameter pipe connectors may be supplied. The concrete wells have pipe joining them near the top, this pipe is curved over to keep it empty, it is possibly for a breather or overflow if needed. Four pipes are placed loosely on each other. They also come in other sizes. There is no bottom in the wells, a 10 centimeter base of gravel is advised. 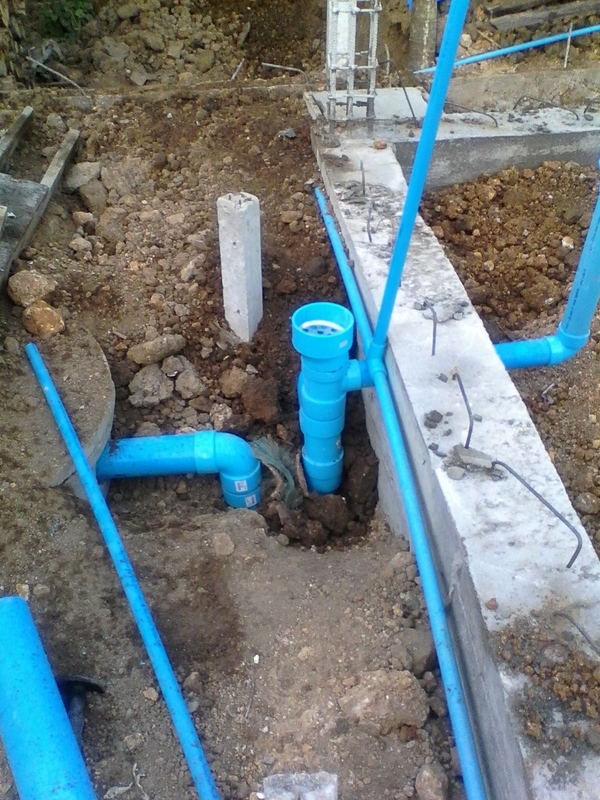 Blue plastic sewer pipes are 10 centimeter diameter. They come in 4 meter lengths and 2 grades, I used the thicker grade throughout. Many hardware stores will sell short lengths of the blue plastic pipe. Elbows, tees and other fittings are available. The thicker walled pipe does not always fit the thinner walled fittings but can be forced to fit. Goose neck or P- trap fittings don’t seem to be available in the bigger fittings. There is a grease trap without a bottom in it for the kitchen sink drain. The concrete wells have a flat concrete lid which is bought separately, the lid has a bung and hole for the bung. There is nothing significantly different about the sewer and drainage methods in Chiang Mai from what we do in Australia. 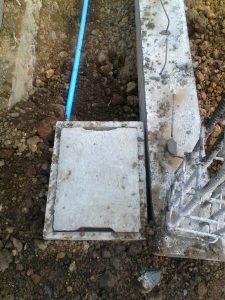 The few different things were, the concrete drainage wells are bottomless where in Australia we might have used an absorption trench, the waste water is processed close to or almost under the house and Thais don’t seem to use P- traps. As the work progressed the engineer produced the drawings and stayed ahead of me throughout the rest of the job.